You agreed to upgrade your phone from apple to a different brand, you spent several hours in creating back up and finally transfer the files to your new phone. You check the files that you have just transferred and decided to listen to your favourite songs then suddenly, you received an error message that says “File cannot be played. The format is not supported.” Isn’t it so frustrating and exhausting? You thought that you followed every step correctly but unfortunately, you missed one important thing, that one thing that could have made the entire transfer absolutely fast and easy. 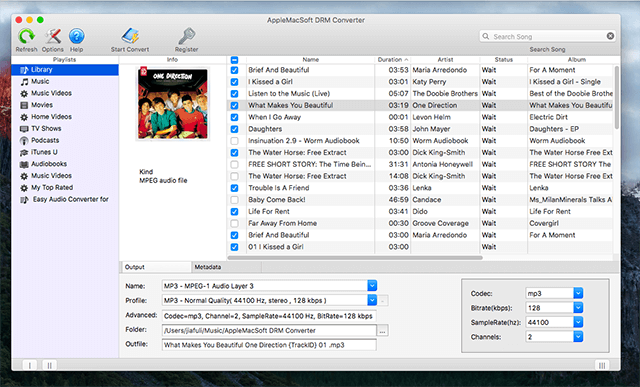 That one thing is called AppleMacSoft DRM Converter, software that is perfect in converting apple music and iTunes Songs to any other format that you need such as MP3, M4A, AC3, AAC, and many other different audio formats so you do not need to worry about compatibility whenever you transfer your music. User Friendly – This software is very easy to use yet offers broad functionalities so it is highly recommended even for those who are not that techie but still aspires to convert their music files easily. The most common tabs are displayed so you do not need to click each tab to see what you need. It is completely user friendly, which is perfect for those who want less hassle in converting. Play your favourite iTunes songs in all your devices – By converting the iTunes music file that you downloaded from iTunes using AppleMacSoft DRM converter, you have also removed DRM, it is a part of a certain music file that hinders you from playing it to a different device. By successfully converting the music to any type of format that you need, you can absolutely transfer it and even put it on all your devices so you can listen to your favourite music anytime and anywhere. Supports even the latest formats – This software supports almost any music format including MP3, AIFF, M4A, AAC, AU, MKA, AC3, FLAC, and many more. That is why once you have converted your file using this awesome software, you need to worry no more about experiencing compatibility problem because it can be played in any device. 100% same audio quality – This is perhaps one of the most common problems that you might experience if you use a low quality converter, the quality of the sound is compromised. If you use AppleMacSoft DRM converter, rest assured that you will receive the same sound quality that you have converted, the quality will remain as it is. Easy installation – Unlike any other iTunes converter, you do not need hardware to completely install it. Just follow the easy steps in downloading, wait for few minutes, install, and you can already use it and enjoy it’s amazing functionalities immediately. No complicated process to ensure fast and easy experience. 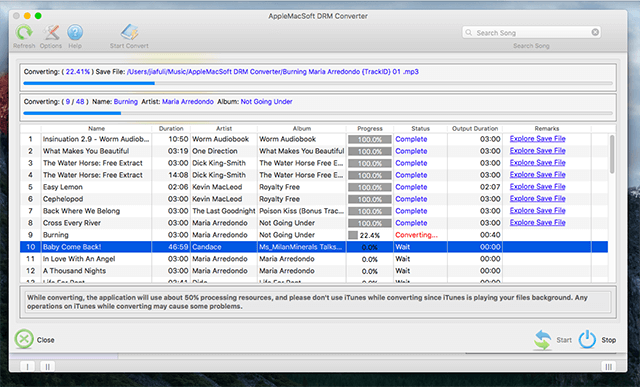 Launch your AppleMacSoft DRM Converter on Mac OS X. Make sure to always click refresh first to ensure that the entire list are completely updated. Check the options on the left corner of the software. You will see there your playlist from iTunes. Choose the playlist or files that you want to convert. After you successfully selected the file that you want to convert, the songs on the playlist will show at the middle part of the software. Check all the songs that you want to be included. On the bottom part of the software you will see several tabs. On the output format, select the format that you want. Example, MP3. Profile tab should be changed to high quality to ensure that the sound will not be compromised during the entire process. After that, click the convert button on the upper left corner of the software. As soon as you clicked convert, the process will start immediately and will take few minutes to complete. Once the process is done, you will see Explore save file option to open it or see your file location. From there, you can already copy the files and transfer it to your desired device. You have converted your music file successfully! The entire process is super fast and easy. So if you are looking for software that can convert your music files to a format that is compatible to almost all types of devices new and old, then AppleMacSoft DRM Converter is absolutely great for you. It is easy to install and use, which is perfect if you want to save time and energy in converting files without compromising its quality. Enjoy your favourite music in any device without getting a frustrating error message with DRM Converter where converting file is always easy.